Actively pursuing many goals within the OKC tech community, StarSpace46 is far more than a coworking office. From hosting educational events to providing vital entrepreneurial resources, keeping the operation active and focused requires the contributions of a diverse team of players. 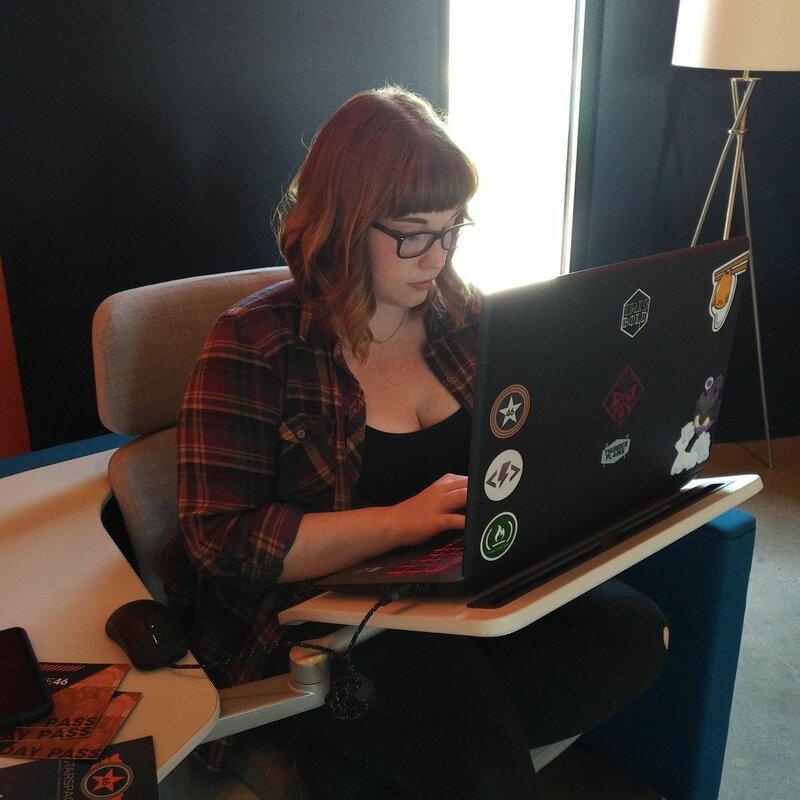 Ava Lynn has been a partner since 2016 and plays a vital role in the day to day operations, bolstering a culture at StarSpace46 that keeps it a safe place for women and other groups within the tech community that often go unrecognized. Ava believes that it is of the utmost importance to make sure members feel involved, and know that they are contributing to a broader community. Her distinct point of view and varied skill set make her one of SS46's most significant assets. Ava Lynn was introduced to the StarSpace46 team by one of the co-founders, Amanda Harlin. After touring the space at the grand opening in November 2016, Ava learned that a receptionist was needed to help with ongoing member needs. Ultimately it was her community management experience with twitch.tv that led the rest of the team to welcome her as a partner. "When I started, I was in a position of 'making my own job.' I still wasn’t certain what my place was among the other board members and overcoming that imposter syndrome was my biggest challenge." Since then, however, she has overcome this challenge in far-reaching ways, contributing to SS46's inclusive and nurturing ecosystem. While the goals of the organization can be categorized in many ways, Ava believes that offering a means for the local community to centralize is one of the most critical roles. “StarSpace46 is the OKC hub for technologists and entrepreneurs who want to collaborate and support each other through services and positive reinforcement. It’s basically like working in a coffee shop, but the people around you are interested in what you’re doing and can help accelerate your business.” Collaborating with and supporting other women in that hub is a responsibility that Ava takes very seriously. With a role that has developed beyond that of receptionist, she also serves as the community manager, frequently fielding questions from members and partners as the first point of contact. “I try to be available to all of our members to make sure they have a positive experience. I’m passionate about making sure women, particularly women who work in tech, feel comfortable in the space. I also manage most of the social media and data automation that keep StarSpace running efficiently,” Ava explained. At Starspace46, business owners and tech entrepreneurs will find a variety of resources including workshops, flexible coworking spaces, free training opportunities, meeting rooms, and private offices. Schedule an appointment to tour the facility and find out more about development opportunities that can enhance your business.